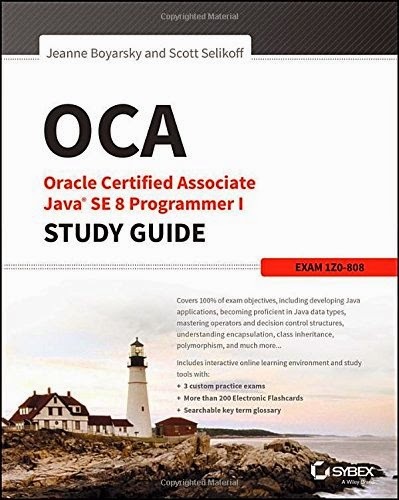 The OCA: Oracle Certified Associate Java SE 8 Programmer I Study Guide is your one-stop resource for complete coverage of Exam 1Z0-808. This Sybex Study Guide covers 100% of all exam objectives. You’ll prepare for the exam smarter and faster with Sybex thanks to superior content including, assessment tests that check exam readiness, objective map, real-world scenarios, hands-on exercises, key topic exam essentials and challenging chapter review questions. Reinforce what you have learned with the Sybex exclusive interactive online learning environment, accessible across multiple devices. Get prepared for the OCA exam with Sybex. Interactive online test bank with 3 practice exams, covering Exam 1Z0-808. Practice exams help you identify areas you need to study more. Get more than 90% of the answers correct, and you’re ready to take the certification exam. 180 questions total! Jeanne Boyarsky, OCA/OCP, has worked as a Java developer for a bank in NYC for 12 years where she develops, mentors and conducts training. In her free time, she is a senior moderator at CodeRanch and works on the forum code base. Scott Selikoff, SCJP, has been a professional Java Enterprise developer for over 15 years. He currently operates Selikoff Solutions, LLC, which provides software consulting services to businesses in the tri-state New York City area.